I have had several requests for breakfast ideas lately, so I will do my best to fulfill those requests. 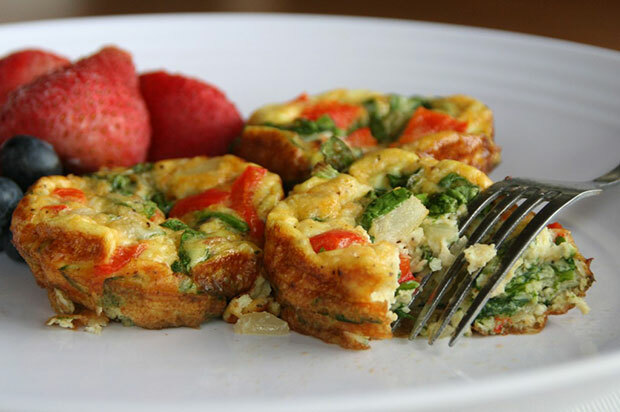 For those of you who like eggs, this is a simple protein-packed breakfast. You can change the veggies to anything you wish, I used what I happened to have in my fridge. Because of the high protein and veggie content, this meal doesn’t have to be limited to breakfast. From time to time I would have a couple for lunch with a side of steamed broccoli. Others might prefer fruit. Anytime of day you decide to eat these mini delights, they are great for you. Saute the veggies (except spinach) in oil or butter on low heat until tender. In a small bowl, whisk together eggs, milk/broth, & cheese if using. Add all veggies and salt to egg mixture and stir together. Pour mixture into muffin cup until 3/4 full.